It was a welcome development by the Nigerian government and its judiciary(court) to have proceeded to revoke the bail granted to the leader of the Indigenous People of Biafra (IPOB), Mazi Nnamdi Kanu. It is certain to everyone that the IPOB leader committed no crime known to law. Self-determination, secession or separation is not an offence in the Nigerian Constitution or any law in existence in the world the last time I checked. They asserted that Kanu is nowhere to be found, that he needs to come and defend himself in the court of law, and that his sureties should provide him or face penalty but they have deliberately and ignorantly failed to recall what transpired last year that led to the forceful eviction of the IPOB leader out of his hometown. He was prepared, along with other Biafra activists standing on trial to attend the upcoming court proceedings before the rampaging Nigerian military men invaded his house on 14th September 2017, in order to assassinate him but ended up killing 28 persons in his house including his dog (Jack). 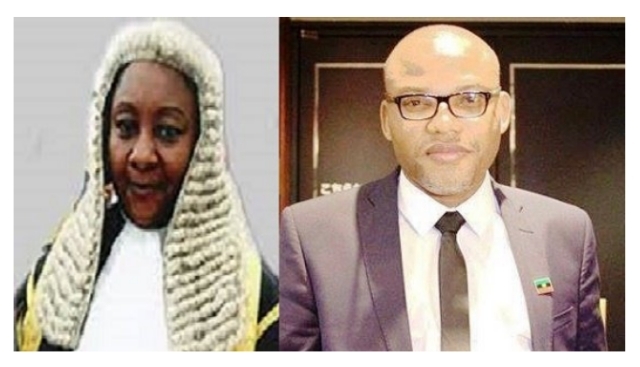 Now, come this year 2019, the trial court presided by Justice Binta Nyako connived with the Nigerian government to revoke his bail and issue an arrest warrant against Nnamdi Kanu. Is that not enough evidence of what the IPOB leader was talking about since 2014, that Nigeria is a fraud and nothing good will come out of it? Instead of the court to stand on its power of independence and inquire from the duo of the Nigerian government and its military the rationale behind the sudden and violent invasion of the residence of a man whose matter is in court and who was a property of the court without its permission. But alas, in their desperation to perpetuate evil, they now twisted the whole incident without recourse to procedures and civilization. Perhaps, the court has been influenced and/or compromised by personal and monetary gains into doing the bidding of the oppressor. Biafrans all over the world, is calling on members of the international community to hold the Nigerian government and its military responsible for everything that transpired in Kanu’s home last year: the forceful eviction, the violent raid, the people they massacred, the stolen properties and the desecration of the Royal Palace of the Afara-Ukwu Ibeku community. It is now clear to everybody’s understanding, the level of fraud and killings and many other heinous crimes and atrocities against Biafrans and humanity going on in Nigeria, and nobody cared to intervene or proffer lasting solutions to the issues because they and their relatives and loved ones are not directly involved nor affected. Biafra is our last hope. With Biafra, light will shine in the African continent, we are tired of one Nigeria; we want and fully ready to go home to our ancestral heritage.